An aerial view of the 18th and 9th Hole and 1st Tee during final round of the Irish Open, Fota Island, Cork, Ireland. 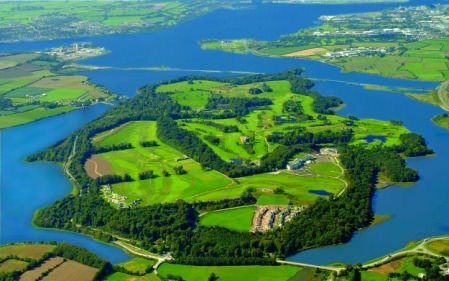 Fota Island’s massive success as an Irish Open venue is no guarantee that the event will return to the Cork resort in 2016 with the Chinese owners keen to reap the benefits of last week's hugely successful staging. The European Tour must keep Tourism Ireland happy and with Fota Island appearing reluctant to try and better what was the perfect week in just two years’ time, the focus for all interested parties now turns to finding a title sponsor that can boost the prize fund beyond €2 million or another partner who can at least increase the money on offer. With crowds of 104,810 over the five official days outstripping the European Tour’s €4.75 million flagship BMW PGA at Wentworth by almost 11,000, the European Tour needs Failte Ireland to retain its current level of investment. With the Chinese owners of Fota Island putting €500,000 in the event, Failte Ireland took the opportunity to reduced its investment by €250,000 this year to just €1 million. But European Tour Chief Executive George O’Grady is confident that the government will not back away now, despite forcing the tour to work harder to cover the €2m prize fund. “The negotiation [with Failte Ireland] will take place after this tournament but I’d be confident that they will see what good value it is for Ireland," O’Grady said. James Finnigan, Commercial Director of the Irish Open said: “It’s very hard to grow the prize fund when the biggest investor is reducing their investment. But nonetheless we have stabilised it and put on a good show this week. “Both governments (north and south) would like a private sector company to become the title sponsor and that’s what we are working with them on and we’re hopeful that a title sponsor will come forward because we put on a good show. “We have some great sponsors: Emirates as the official airline, BMW as the official car, Rolex as the official timekeeper and Heineken as the official drinks company. “But unfortunately in this market place, the value that they associate that position is not what it is in other markets because Ireland has only some many chimneys and there are only so many people who can buy their product. Northern Ireland will host in 2015 and 2017 when Royal County Down and Lough Erne are the venues. But it appears likely that 2016 is too soon for a Fota Island return with the new owners of the resort currently building a portfolio of four and five star irish properties to be called the Fota Collection. Pádraig Harrington believes the event must return to Fota Island at some stage soon and reckons a title sponsor is crucial. He said: “I love the venue. I think it's a great venue for a golf tournament, the setting, the type of course it is. Certainly Fota Island seems to get nice weather. Nice practise facilities, hotel on site; what more could you ask for in a venue with an airport nearby. I hope it comes back and gets onto a rota that it comes back here regularly. It really is an exciting golf course and lends itself to hosting a big championship like this. “I'd be all for a title sponsor but I think it's got to be the best value event in the world here. It look goods on TV, crowds turn out, you're getting coverage all around the world, Golf Channel, the States, Asia, South Africa, all around the world. This is value for money, no doubt about it. Fota Island's Chief Executive Jonathan Woods was ecstatic with the success of the event and did not rule out the Irish Open's prompt return. “We're delighted, the resort has been shown all over the world in glorious sunshine and everybody seems to be very happy," he said. "We've had huge, record-breaking crowds, so as a resort we couldn't have asked for any more. “We haven't had any negative feedback from anybody, and from speaking with the European Tour's (chief executive) George O'Grady, he's absolutely delighted with the event. We knew it had been such a long time since the event was in Cork but that there was such a huge appetite for the event here in Cork and we had to convince the European Tour of that and they're happy today. From a famine to a feast — three Irish Open venues announced in 80 days; Trump lurking for 2016? A week might be a long time in politics but when it comes to future of The Irish Open — and a possible Northern Ireland staging of the British Open — changes are coming equally thick and fast.